Magpie Wireless barcode readers for connection to mac or pc, usb. 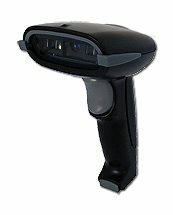 "Works With Every Application No Software Required"
Magpie III barcode scanners are ideal for use in every situation. They work with all applications straight out of the box. Robust enough for light industrial but ergonomic enough for retail and office use, the Magpie works well in every situation. It's ease of cleaning makes it ideal for healthcare and medical applications, and it's light weight make it ideal for repetitive use in applications such as Libraries, Asset and Item Tracking. Below are just a few of the applications the Magpie works with. The Magpie integrates seamlessly with Filemaker, you can use it in Filemakers find mode to automatically initiate the searches with the Enter key (a feature not found on most barcode readers). You could also program it using the manual to automatically tab between fields or even trigger scripts at the start or end of a scan. Make using Quickbooks easy, scan barcodes to instantly add item details to orders or sales invoices. You could also use barcodes on invoices using our other software to instantly look up invoices. Click in any cell and scan a barcode, to instantly enter the barcode number into that cell, use the Kestrel to instantly search your spreadsheets by scanning a barcode, automate existing spreadsheets using barcodes instead of manual entry and reduce errors. Set up to tab between fields the Magpie can instantly add items to sales by scanning a barcode..
Scan straight into any Microsoft Word document, enter data into tables, or simply scan straight into a file to use as a list. Scan straight into any Microsoft Access form, enter data into databases automatically, automatically run lookups and vb scripts simply by scanning a barcode. The Magpie scans straight into any 4D input screen, automate your 4D application. You are only limited by your imagination. Wherever you can type, the Magpie can scan, in this way you can automate thousands of applications with barcodes, enter forms in Explorer or Safari, create lists in Notes whatever you want to do, if you can scan it the Magpie will do it.. Copyright © 2013 Barcode Readers.com a members of the Peninsula Group. Last updated on 22nd of April 2019. All rights reserved worldwide.